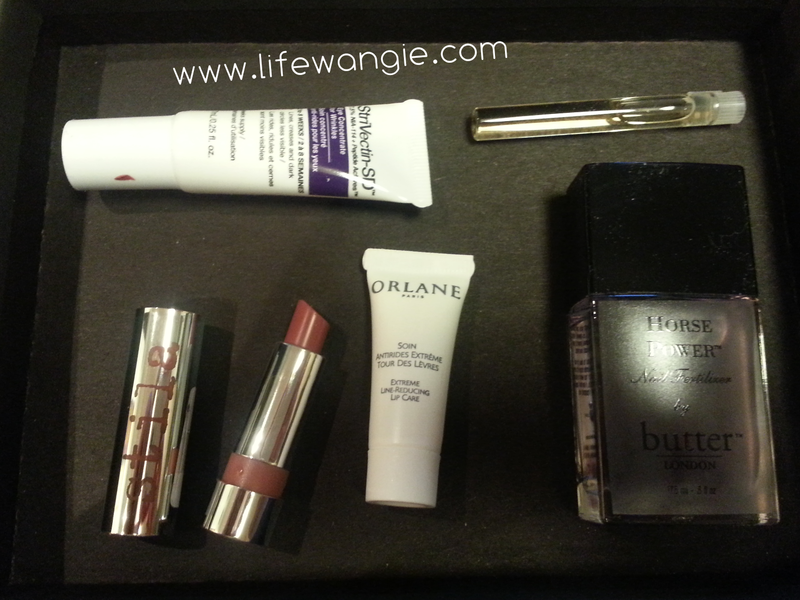 Life With Angie: Sample Society Review January 2014 and Beauty Bar Coupon Code! Sample Society Review January 2014 and Beauty Bar Coupon Code! I just realized that I haven't posted yet about my Sample Society box from January! It's almost time for the February box, but I would be remiss to leave January out because it had two of my favorite products of the month in it. Yes, that IS a full-sized Butter London Horse Power! In addition... four other great things. Sample Society is a very high-value sub box, but for some reason you don't hear about it as much as some of the others. I think it is because they don't have a referral program, so girls are not constantly plastering Facebook with posts about it. The site that they are based on, does, though, and if you use my code: ANGIEK, you can get 20% off your first purchase. You can actually use that code once on each of the nine "Familyhood" sites. You will get 20% off on each site if you are a new customer. Sample Society is only $15 a month (plus tax where applicable) and you always get very high value items. You also get a $15 off of $50 purchase coupon for full size items, so if you do an order, you basically get your money back. You have to include at least one item from one of the brands in your box that month to use that month's coupon. I don't always use the coupon because oftentimes the samples themselves are big enough to use for a while. The Sample Society box itself is well worth the money even if I don't use the coupon. Horse Power retails for $20, and this month I got four additional deluxe samples: a Tocca fragrance sample, a wrinkle treatment from Strivectin, an Orlane lip treatment, and a Stila lipstick. I was very excited to try out the Tocca fragrance. I love high-end fragrances and had been wanting to try them. Besides the Horse Power, the other item that I absolutely loved in this box was a Stila Color Balm Lipstick. It's a nice creamy lipstick that has peppermint oil in it, which feels great on my dry winter lips. Lord knows I do not need any more lipsticks, but I might just go nuts and order a full size one or three this month and use my coupon.